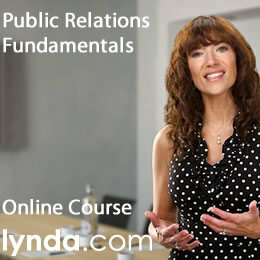 Social Media and Public Relations: Eight New Practices for the PR Professional, will be available on May 4th! As a part of the book’s launch, I thought it would a good idea to share some of the material that didn’t make it to print. So, I’m continuing with my chart series, which are all of the charts cut out of the production process (due to space constraints), when we were in the final home stretch. Today’s post discusses the chart from PR Practice #3, which is the PR Technology (Tech) Tester. 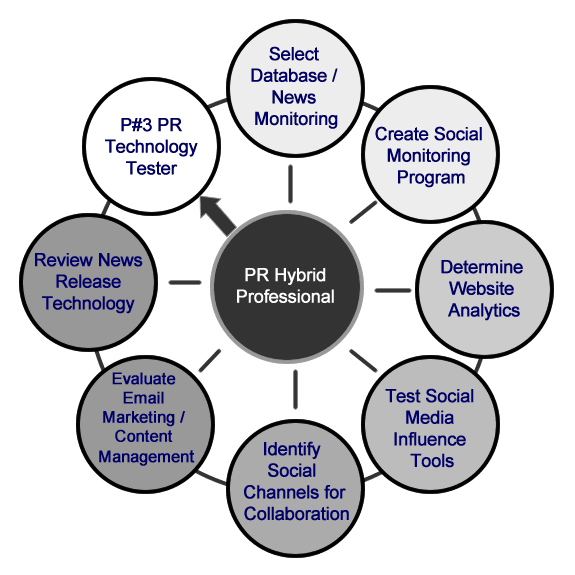 The PR Tech Tester’s new role is to experiment with different types of technology for better internal and external communications, which results in building stronger relationships. You can see from the wheel visual that there are several new roles and responsibilities for you to learn as a PR Tech Tester. Learning, embracing and educating your peers on these responsibilities will make you a more valuable asset in your organization. I’ll be doing a blog post in the next couple of weeks focusing on the results of a pilot study which reveals what employers look for in young professionals entering into the workforce, with respect to knowledge, skills, values and sensitivity. According to the study, information technology is among the most important skills and, today, is considered a core competence. Technology offers you unlimited access an online searchable, contact database where you’re able to keep up with media and blog contacts, and their pitching preferences. These services also offer you instantaneous access to your company’s media coverage, as well as intelligence on competitor mentions and trending industry topics in real-time. Researching and testing the technology allows you to find the right solution and will help you to follow, engage and build better relationships with specific journalists and bloggers who would find your content to be relevant and newsworthy. As a PR Tech Tester, you will immediately notice many of the social media monitoring platforms today allow you to track daily conversations across platforms, your share of voice (SOV) against competitors and your company’s brand sentiment. These platforms also offer information on key influencers, word cloud formations revealing relevant topics, and top domains where the most relevant conversations take place. Selecting the right social media monitoring tools will help you to strategically put a system in place, offering a tremendous amount of intelligence; from trending topics to the critical issues of the people you want to reach. PR professionals are getting more and more familiar with the value of website tracking and analytics. Where social media monitoring ends, website analytics begin. 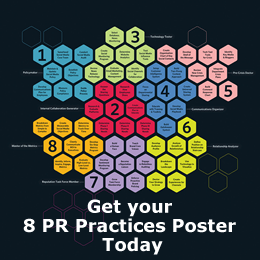 Typically, PR professionals have relied on the marketing and/or web team for website analytics. But, with your social media programs and stories driving people to your company’s website and newsrooms, you can no longer rely on someone else providing you with the analytics you need. The ability to track analytics in real time allows the PR Tech Tester to understand a great deal about the behavior of an audience, from how many of your active visitors have actually been to your site before and how long they stay to how many people go to certain pages of your site, revealing the most popular areas. When you discuss online influence or social media influence, from a technology standpoint, it’s an algorithm that helps you to capture the most powerful people in your network. However, there are different algorithms based on the tools you choose. For example, one influence tool might calculate variables including reach, amplification probability and overall network influence. Another tool might measure different criteria, such as impact, engagement, clout, signal and the velocity, at which you share. It‘s important to familiarize yourself with these tools in your research process as they (1) help to identify people who may have greater impact on their own networks, and those who may be more likely to share your company’s content, as potential brand champions. The social media landscape is constantly changing and PR professionals must keep up to date on the new and different collaborative platforms, where their brands have an opportunity to engage with stakeholders. As a PR Tech Tester it’s your job to know the platforms where your audiences congregate and the technology they prefer. One of the best ways to keep updated on the latest platforms is to subscribe to blogs/bloggers that report on technology, social media and latest and most interesting collaborative platforms for businesses. Stepping outside of your regular circle / network of peers, and interacting and/or collaborating with professionals who have a stronger focus on business and technology will give you insight into many of the new evolving platforms. In the past, most PR professionals were not focused on platforms that managed content and sent out numerous emails at a time. PR pros were used to crafting single, customized emails to media contacts. However, today, in order to accurately reach and track responses from numerous contacts, you need an email platform that enables you to customize and then monitor the open and response rates. 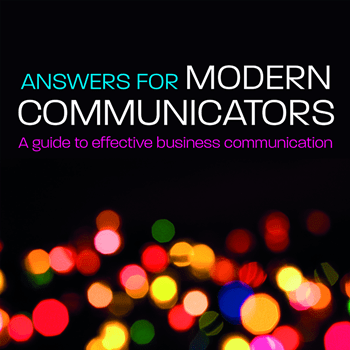 PR pros will benefit from sending out their news releases or pitch letters to a select group of contacts through a software management system to learn the number of emails sent out, the open rate and the bounce rate, the number of people who click as well as who forward your correspondence. 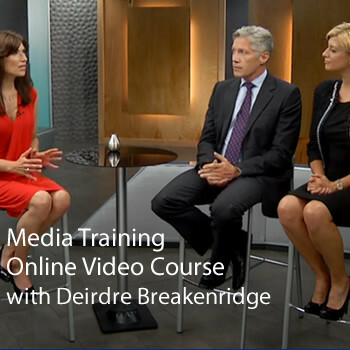 Because the media landscape has changed, PR pros are faced with decisions regarding how to share business stories. As a PR Tech Tester, you will realize how there are a few options. One option is the use of a wire service that has ramped up distribution capabilities to include 2.0 functionality and reach. They offer the ability to distribute your news release beyond traditional print, broadcast and online media outlets to reach bloggers and consumers. Then, on the other end of the release spectrum is the Social Media Release (SMR), which is a community tool for sharing news and customized stories. The SMR is highly interactive and is housed on a blog platform. PR Tech Testers need to research and decide the best approach to sharing their stories with the public. Being a PR Tech Tester and finding the right technology for your toolkit is trial and error. Today, technology is no longer someone else’s job. You have to roll up you sleeves to experiment and make it an integral part of your programs for better engagement and communications impact. 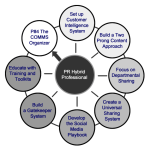 6 Responses to " PR Practice #3: PR Tech Tester Chart of Responsibilities "